Ice cream, frozen yogurt, gelato, sherbet, sorbet and vegan frozen desserts are favorites on the dessert menu when it's too hot to bake. Here are seven of my recipes to help you beat the heat. 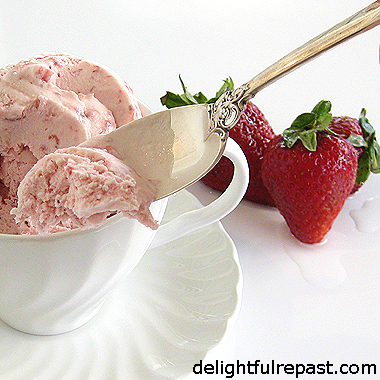 Strawberry Ice Cream is my all-time favorite. I've even served it at afternoon teas in the garden - in teacups, of course. 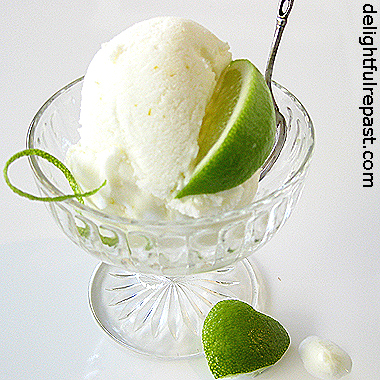 Lime Sherbet is so refreshing on a hot day and makes the perfect dessert at a summer barbecue. 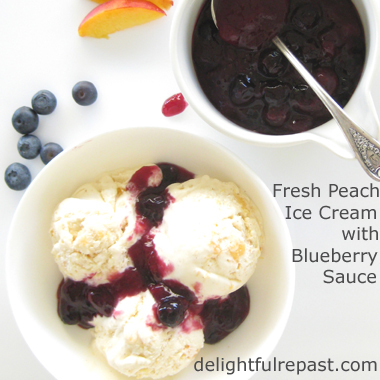 Peach Ice Cream - with or without the blueberry sauce - is something I can't get enough of during peach season. Vegan Chocolate Ice "Cream" is a recipe I developed for vegans but have only ever served to non-vegans - and they all thought it was regular ice cream! Strawberry Frozen Yogurt is right up there with strawberry ice cream on my favorites list. 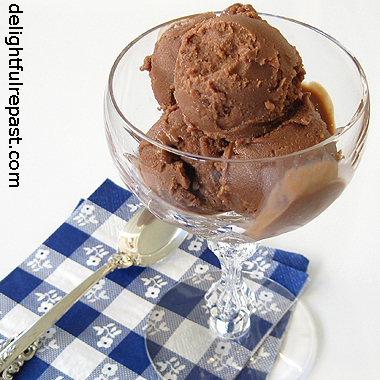 Coffee Chocolate Gelato was the first recipe I developed for my self-refrigerating compressor ice cream maker. But you can make it in any kind of ice cream maker. 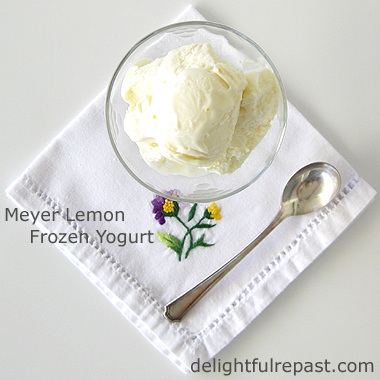 Meyer Lemon Frozen Yogurt is Mr Delightful's favorite, and it is pretty wonderful, if I do say so myself. See my Recipes index page for more. I haven't had any ice treat this year...we have such a lousy summer...already feel like Fall over here...lots of rain this year and so little sun that my tomato plants ain't doing good at all..those ice treats are really great treats in summer! Maybe I should just turn on the heater and enjoy some ice cream! Angie, I'm not a summer girl at all. I like rain, cooler temps, spring and fall. But tomatoes definitely don't thrive in the kind of weather I like. Sorry about your tomatoes. Yep, just turn on the heater and have some ice cream! Just delightful!! !I love ice cream and love your napkin too!Great post as ever. Thank you, Maristella. I got that napkin, along with many other linens, from a friend whose mother had left them to her. I wish I could try them all. Big sigh. Amalia, thank you. I hope you will! Sully, one doesn't like to assume. So I am surprised and delighted by the 5 Cleavers award and humbly accept it. You should try to recreate your mother's recipe. I love doing that! Oh my....... you've hit on my weakness, ice cream. It is not safe in my house. I haven't asked for the ice cream attachment for my Precious because I'm afraid I'd eat ice cream EVERY day!! Mrs Shoes, fear not. You really *wouldn't* eat ice cream every day - you would just make it once in a while. It could actually cut down on your ice cream consumption if you made a rule that you would eat only homemade! I'd love to try them all, they're such a temptation ! Thank you, Dany dear, and I hope you are enjoying your busy summer! 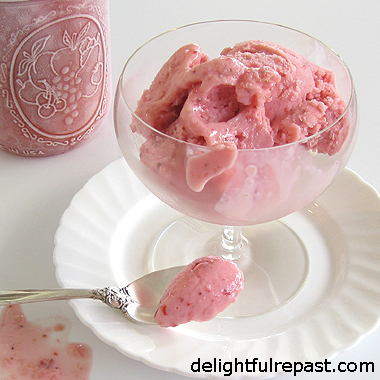 Jean, these all look fab, and you are such a gem to share ice cream recipes devoid of dairy!! I must try them out, as well as the coffee-chocolate, mmmm! Thank you for sharing! Thanks, PP! 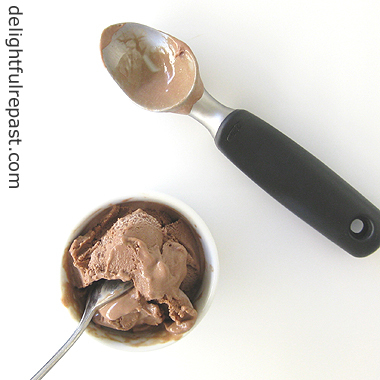 If you are on a dairy-free diet, try the Vegan Chocolate Ice Cream recipe and let me know how you like it! All of these look so yummy! I think my husband's favorite would be the lemon too! Thanks, Mindy! Whip up a batch for him soon. Such a refreshing post. This cooled me off just looking at the photos! Ellen, thank you. That is exactly the effect I was going for! Whew, Jean, I feel cooler just looking at all these lovely, frosty desserts. It is well after 5:00 pm and still over 90'F outside. Our Summer of Sizzle continue! I have been "dreaming of a white Christmas" and hope winter comes soon! We love snow. In the meantime I think ice cream is in order! Thank for your recipes. Lily, thank you. And I think I have about a dozen more ice cream recipes listed under Desserts on my Recipes index page. I hope you'll try one or two and let me know how they turned out for you. Stay cool, my dear! I wanna try them all! Cool for the summer! Thanks, Margie! I'm doing everything I can to stay cool! Mmmm.... all of these look divine, my friend! I agree wth Margie, I want to try them all. There isn't a frozen dessert there that I wouldn't go absolutely ape over. They all sound delicious!! Unfortunately the only kind of frozen dessert I can make is the no-churn kind. The Hubby knows that we have no will power when it comes to ice cream and the ilk -- so no ice cream maker. I have cheated a bit with the ability to make the no-churn kind. Where there's a will there's a way!! Great recipes. I will pin just in case someone should give us a gift of an ice cream maker. So many delicious ones - let's see - I'll take them all! Thanks for sharing "coolness" on another hot day! Marisa, thanks so much! Really, though, with the Cuisinart ICE-21, you wouldn't go overboard because you need to freeze the canister for 24 hours before making a batch, and you can only make the one batch. Then you have to freeze the canister again. Thanks, Bernideen! It does make a nice way to cap off an afternoon tea on a hot day! It has to get really hot for me to feel enthusiastic about ice cream, but your recipes are absolutely mouth-watering. And serving in a teacup is especially chic! Pauline, thank you. Yes, I'm the same way really. Most of the time I prefer a baked good of some sort (and a cup of tea)! I'd love to sample each and every one of those frozen delights, Jean, especially the strawberry ice cream and strawberry frozen yogurt. I love serving ice cream in pretty teacups, too. It makes it that much more special. Thank you, Kitty. Yes, I think a homemade ice cream deserves a special presentation! Thanks, Cathy. Actually, the Vegan Chocolate Ice Cream IS dairy-free! Oh how delicious they look. I love your presentations - beautifully done! Thanks so much, Kelly. They were fun! 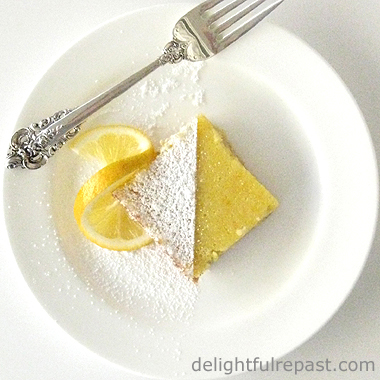 What a wonderful round up of cooling desserts! Thanks, Jean! Regine, thank you so much for stopping by and commenting. I hope you are getting the rest that you need. Ruth, thank you so much. I always love a good tea party! Thanks, David. And I know *you* appreciate the need for cooling desserts right now! Well, these are CLEARLY to die for. Love ice cream. Summer's best treat! And they all look wonderful! These treats are delightful. Perfect treats to cool us off in this heat. Thank you, Jeanie. And making ice cream seems like just the thing one should do at a cottage on the lake! Linda, thank you. And, yes, isn't the heat awful?! Yes, Tandy, "elevenses" is such a fun term! Since it's cold in your country, I'd recommend one of the ice cream recipes I developed for winter - pumpkin pie or eggnog ice cream! Thanks, Sue! I might even get in the mood for one of the chocolates! Thank you, Karen! I hope all the smoke has cleared now. I'd like a scoop of each, please, Jean! Every single flavour of ice cream and sorbet looks so good. I'm particularly taken with your vegan chocolate ice cream. Thank you so much for sharing this great resource for summer entertaining (and treats! ), and for being a part of Hearth and Soul. Hope your weekend is lovely. Thank you, April. Love the Hearth and Soul! They all looks so delicious. Perfect for hot summer days and nights. Thank you, Carol. I can't decide which one to make for the weekend!